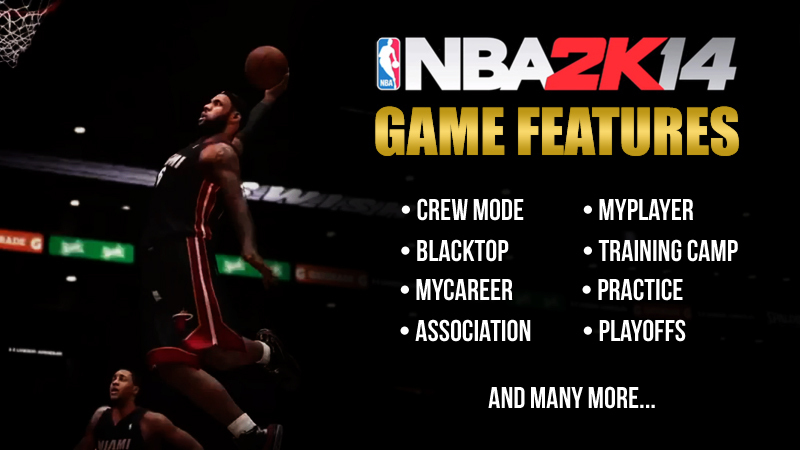 Description: 2K Sports revealed the official list of features for the current generation version of NBA 2K14 (PC, Xbox 360 & PS3) after they officially announced the return of Crew Mode. The list includes new game modes, returning features, and gameplay improvements. The NBA 2K14 development team has been busy this Summer working to deliver on the promise of greatness that fans have come to expect for not one, but two, different generations of consoles. 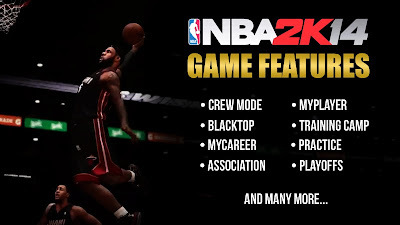 Today 2K is releasing a high-flying feature list along with highlights of several core gameplay improvements coming to NBA 2K14 on current generation platforms. With LeBron James, the king of basketball, at the helm, 2K is continuing to strive for greatness and NBA 2K14 will once again be second to none. • Euroleague - Exclusive to NBA 2K14 - play with 14 of the top European teams, featuring authentic uniforms and players. • Dynamic Living Rosters® powered by Stats, Inc. - Player attributes and tendencies automatically update daily to reflect true life hot and cold streaks. Now, each game played in the NBA can have an effect on your game. • King James Soundtrack - Featuring artists and tracks hand-picked by LeBron James, including JAY Z, Eminem, The Black Keys, Daft Punk, and many more. • Pro Stick™ – Throw down show-stopping moves, pull off intricate shots, and toss flashy no-look passes with deadly accuracy with Pro Stick control. Easily the most intuitive basketball controls ever implemented. • 2K Smart Play Button – Quickly call the most suitable play for the context of the game by simply holding a single button. • Improved Player Motion System – With an all new motion system, player movement is much smoother on both ends of the floor, while also allowing for much more explosive cuts and tighter control. • Depth of Content – With significant upgrades in nearly every aspect of the game, both on and off the court, NBA 2K14 boasts more animation content than any previous basketball title, and includes more than 3000 new animations. • Signature Skills – Six new Signature Skills, ensuring each NBA player’s unique abilities are represented in the most authentic way possible. • Playbook and Play System enhancements – The deepest and most authentic playbook gets even deeper. Execute new half-court sets, experience improved spacing logic, and run updated team specific plays. • More Signature Styles - New jump shots, dunk and layup packages, dribble moves, free throws, pre-game intros, getbacks, celebrations and more. • Shot System Upgrades – More realistic footwork on jump shots, improved awareness in shot selection, and a variety of new shot types. Whether you use the new intuitive Pro Stick™ or the enhanced Smart Shot Button, attacking the rim is now more exciting than ever. • Dribbling Advancements - Upgraded dribble movement and new branching technology give you much greater 1-to-1 control over the ball handler. • Enhanced Passing – More accurate pass targeting, new give and go mechanics, better handoffs, and an entire arsenal of new flashy passes. • Learning Defensive A.I. – Test your skills even further with new defensive AI that sees where the offense is being successful and adjusts strategy to take those advantages away. • Block Improvements – The block system has been completely revamped for NBA 2K14 with improved ball targeting and awareness, more realistic physics, and more responsive control. All new player collisions, the ability to block dunks, and more appropriate shot contests make playing defense much more fun and rewarding. • All New Ball Denial - No more getting stuck during off ball bumps and ball denial, allowing for complete freedom of control over your players away from the ball. • Enhanced dribbler vs. on-ball defender contact - Defenders can now initiate steals, hard bumps, and charges out of defensive rides, making locking up players on defense a much more engaging experience. • Expanded Defensive Commands – New commands using the right stick: including contesting shots, contesting passes, and denying or pressuring the ball.